How can one not get depressed in this day and age? For me to claim that I never get depressed would not only be a lie, but an absurdity few would believe. For crying out loud – with varying degrees of severity – I’m only human! I’ve heard some tell me, “But brother, you’re a minister, a pastor! Real Christians never get depressed.” I usually respond with, “Have you never heard of Jonah? Elijah? Spurgeon?” Even the greatest men of God have fallen into times of deep despair, so what makes me immune? Depression can come on at times when we least expect it, draining all joy and optimism from even the most hopeful. However, if we can distinguish what sends us into downward spirals, those initiators of depression, it would be much easier to stay upbeat and positive. I think I have found one of those initiators, and it’s called Facebook. 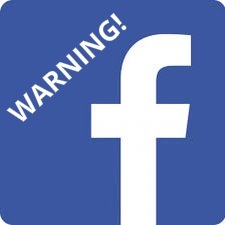 I think that Facebook should come with a “warning” label. Seriously! It can be dangerous! It can be utterly depressing! Think about it, there’s really very little by way of good news on Facebook. Sure, there are the regular kitten pics and funny memes, the morning devotionals, and the occasional video of someone looking like a fool, but where’s the hope? Where’s the good news? Honestly, I think there should be a big, fat warning label on Facebook, at least for my sake. Nevertheless, I may have learned my lesson. That was it! How can I remain hopeful, joyful, happy, and upbeat when nearly everything I see on Facebook is bad news? There’s reports of terrorism, possible financial collapse, children missing, rampant immorality, religious persecution, Christians acting like heathen, and even stuff to make me envious…why think on these things??? Seriously, a great deal of the depression with which many of us battle could simply be the result of looking for hope where there is no hope. Will my political party win? Will there be something funny to make me smile? Will someone somewhere finally make the Freedom From Religion Foundation and the Westboro Baptists shut the heck up? What does it matter? Who cares?!! Has God lost control? Has his arm become too short, his hand too weak? Has a single nation risen or fallen outside His sovereign will? NO!!! The GOOD NEWS is that God is still on the throne; I am His child and He loves me; He loves the world so much that it doesn’t matter what they’ve done, He’s still ready and willing to forgive; no law of the land can change the law of God; and one day all things will be made right. So, the next time you find yourself feeling a little depressed, put away your phone and do a little social networking with the Lord…there’s no app for that. *NOTE: Andrew Zuckerman did not approve the use of the Facebook logo for this post. However, if I ever start making any money from this blog I will take the image down. Until then the warning stays. Consider it free advertising, Mr. Zukerman. This is why I had to stop using Facebook a few years ago. It made me feel really down. A lot of blogs also do that to my spirit. I’m happy to say that yours doesn’t. 🙂 I still have to make sure that I connect with God first and get fed by the Bible first before anything else. It doesn’t take much neglect of one’s spiritual life for the effects to be felt.